Perrys in Adam’s Morgan describes their restaurant succinctly as “Eclectic/Sushi”. That just about sums it up. Explaining Perrys in more detail goes a little like this: “Well, the menu ranges from fresh sushi, to burgers and fries, to couscous with harissa, and mussels in coconut curry. The dining room is cozy, the rooftop’s a party, oh, and then there’s the Sunday Drag Brunch.” While sounding rather like a prepubescent boy lacking direction, somehow Perrys pulls it off. They have been a unique DC staple with a loyal fan-base since the restaurants inception in 1984. Gluten-free sushi eaters are used to sticking with simple (some would say boring) rolls and providing our own packets of g-free soy sauce. However, Perrys is well versed in dealing with gluten allergies, was fully prepared to handle my inquisitions, and even had tamari sauce at the ready. I ordered the “Perrys Roll,” with tuna, salmon, surimi crab, and avocado, substituting fresh crab for the glutinous imitation stuff (better anyway). The waiter also suggested I have the roll made with their soy wrapper, as they do not guarantee that their seaweed is celiac safe. 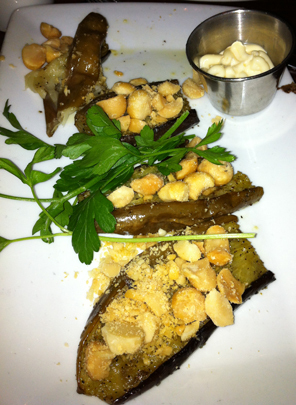 To accompany my sushi, I added a side of “Roasted Eggplant with Macadamia Nuts” from the American cuisine menu. The waiter piped in that he would omit the balsamic glaze, as the vinegar bottle mentions possible contamination in production. By the end of an arduous ordering process, I found myself in an interesting situation where the waiter was being more cautious about my allergy than me! The restaurant’s attentiveness proved suitable for even the most sensitive of gluties. And they certainly have made me think twice about the seaweed used at my favorite Japanese establishments. 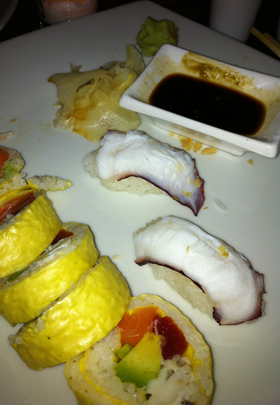 Categories: 3 Spoons, American, Gluten-Free, Sushi, Washington DC | Permalink.